Every kids in the world know Dora the Spanish-English speaking little explorer girl who always accompany by Boots her monkey friend. 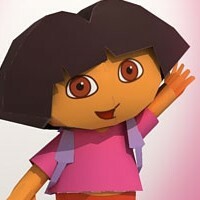 Dora is very famous in tv channel, merchandise and fun games. My daughter once is very much huge fan of Dora when she was still in a playgroup. Now she is adoring Barbie very much, she already forget about Dora, perhaps because she has grown up a little bit, she is now in elementary school 1st grade. But when I tell her that I was making Dora figurine she was very excited. 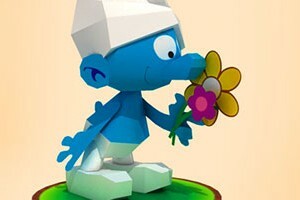 This template only has two page, the overall height of this assembled paper figurine will be around 15 cm or 6 inches. Last month my wife, my daughter and I was watching Kung Fu Panda 2 in 3D. It was the first time my daughter watching movie in 3D at XXI Pejaten Village movie theater, Jakarta. She was very excited so was me and my wife. We have fun together there, to me Kung Fu Panda 2 is a lot funnier than the first one, and still with a good moral message, a very good movie to watch with our family, a good entertainment and education for kids. 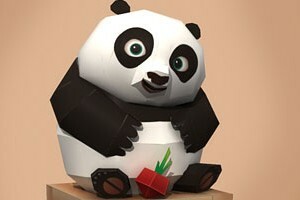 When I saw a cute baby Po for the first time I thought I have to make that in papercraft form, so here it is a simple yet cute paper craft template of baby Po figurine with radish crate. 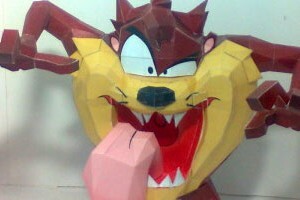 This papercraft is designed by Reza "Ongo" Nalendra (Ongo Arts), I think this taz is the best version I have ever see in the net. He separate instructions and templates in 2 files. Templates file is big so I had to split them up into 3 pieces, I use the word piece so it will not confuse with parts. This characters is based on cute wild animal in Tasmania island, Tasmanian Devil. Where is Tasmania island, it is on the south of Australia continent. 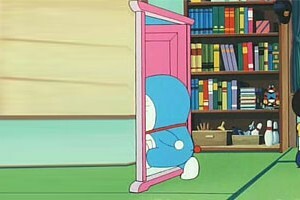 Doraemon always has cool stuff inside his pocket, this is one of the coolest future technology he has, a door to anywhere, a space portal. I wish I have this, I have a long list about business I can benefit using this technology :p. My friend Rino has the same thought as he created this papercraft.